The eye of deity Ganesha serves as the subject for this semi-abstract painting by Santhan Limpaiboon. 'Ganesha is usually revered as the remover of obstacles, patron of arts and sciences, and the deity of intellect and wisdom. As for me, it gives me strong feelings. 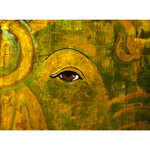 Every time I run into an image of Ganesha, I feel like a blessing that gives me a strong determination. It occurs especially when I look into the eye. Not only there is something that empowers and encourages me, but it also radiates kindness," says the artist.